Today we announced a really cool new feature here at ClickPoint Software. I always love it when we find a way to take something currently done in the industry and make it better. 800 IVR call routing is not new. It has been around for awhile now but from what we have seen there have been limited routing capabilities. I am excited to see our development team brainstorm and come up with new routing techniques that will ultimately make our customers more money. You can use your current advertisements like: Radio, Direct Mail, E-Mail, and SEO with your 1-800-Vanity#. Now you can create live call transfers without a telemarketing team, predictive dialer, or annoying telemarketing calls. Check out the TCPA violations. Create live leads by driving customers to your 800 number. Let the phone system and LeadExec work together to send that caller to your clients in real time. Best of all LeadExec will record every call and allow you to play recordings inside of LeadExec. We can also provide a reverse 411 lookup to include name, address, city, state, and zip information on inbound calls. We built several reports that can be exported to PDF, CSV, XLS, HTML, and more. With this new reporting system you can see all the revenue your generating by driving traffic to an 800 number. It’s pretty amazing. Give us a call and I will have one of tech support specialists walk you through a demo. 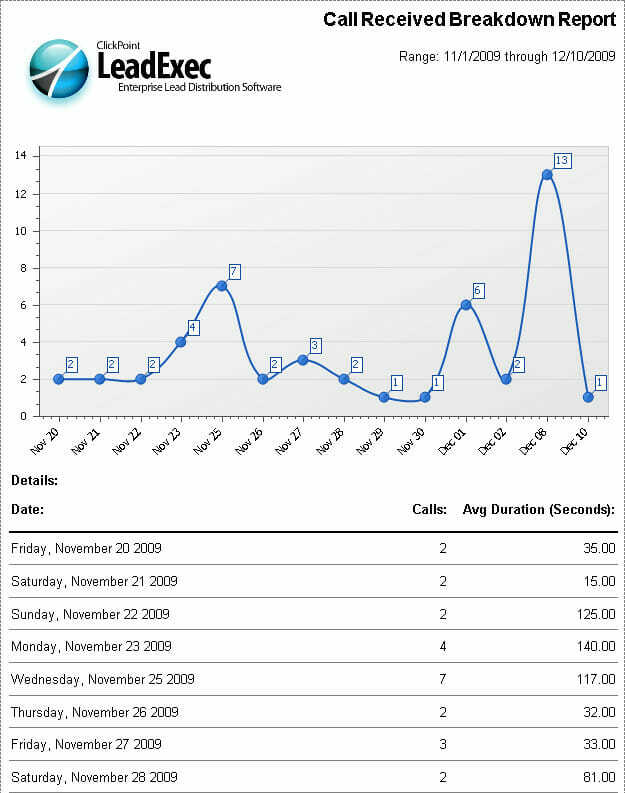 This entry was posted in Lead Generation System and tagged 800 IVR Call Routing, Call Routing, Lead Management, What is 800 IVR | 800 Number Services | IVR Pricing on December 10, 2009 by Gabriel Buck.